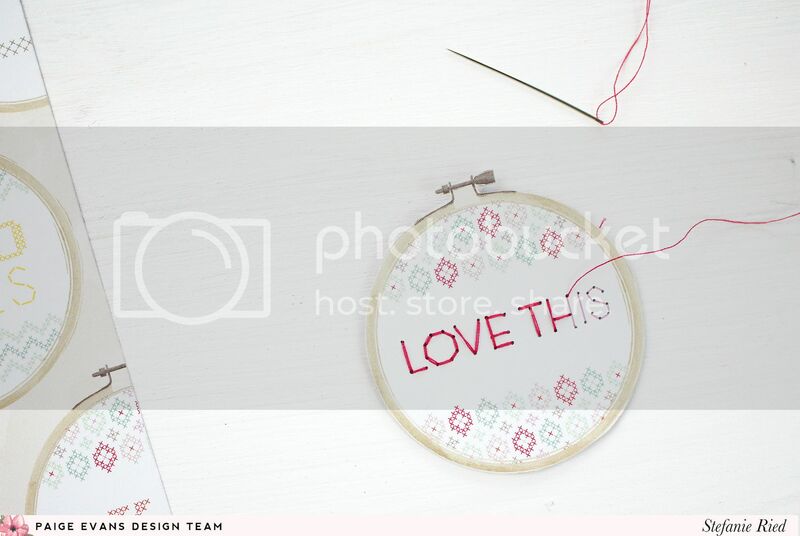 You are going to LOVE the layout that Stefanie Ried made for her first Design Team project - it is so clever and detailed and unique! She created her own embellishments using supplies in a way I never would have thought, so much talent! First, let's get to know Steffi better! Tell us about you! My name is Stefanie and I'm a wife, mommy of a 4-year-old girl, family photographer, and lover of summer. We live in a small village in the southern part of Germany and I enjoy living here. I love the quietness and natural countryside. And for me, it’s the perfect place to be creative. After my daughter was born in 2012 I was looking for ideas to create albums about her first year and I found some great scrapbooking pages. I was totally amazed by all those talented scrapbookers. I love to play with all the beautiful patterned papers, embellishments, and watercolors. My layouts, mini albums, and photos are mostly about my daughter, our travels, and the little moments in my life. What are some of your scrapbooking accomplishments? 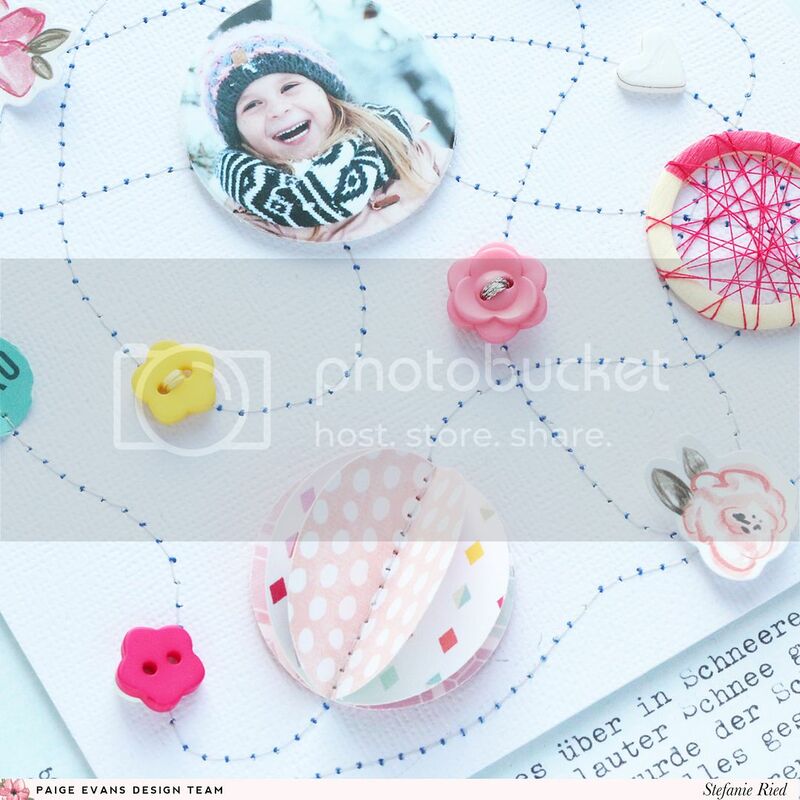 Since 2014 I have been on the design team for Scrapbook Werkstatt. 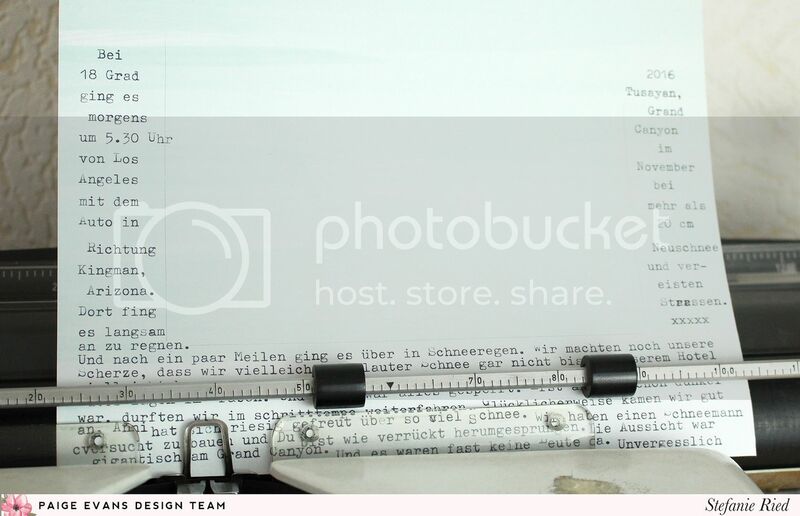 Past design teams include In The Scrap and Papierprojekt. I have guest designed for Maggie Holmes, Gossamer Blue, Citrus Twist Kits, Studio Calico, Sweet Möma, ScrapbookExpo, CSI Color Stories Inspiration, Scrapideesleblog, and studioescrap. I teach mini book classes at Big Picture Classes. I was contributor in classes by Wilna Furstenberg and Catherine Davis at Studio Calico. Likewise, I was contributor for In The Scrap (an online workshop) and for Citrus Twist Kits. I have had projects published in Jot Magazine and “"Idées Créa Cartes et Scrap"! 1. I'm obsessed with sequins! You can find them on the most of my projects. I love them in all colors! 2. My daughter loves to make my hair beautiful with hair-slides and hair-clips. Once when I went to the super market with them in my hair people said to me, “What a nice hairstyle you have!”. 3. Tom Hanks is my favorite actor and I love any and all movies with him. Who doesn’t love Forrest Gump? 5. I like reading travel books and stories about people who made a world trip. That would be a dream for me. Hello and welcome to my very first post. 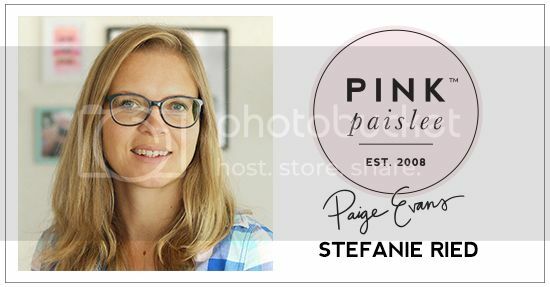 I am very excited and very happy to be on the design team of the amazing Paige. Yay! I made a layout with the beautiful collections Fancy Free and Take Me Away. The colorful buttons are my favorites. They are so very cute. Also I love sewing on paper. Therefore, I wanted to incorporate both on the layout. The photo of my daughter was taken in the snow during our vacation in November at the Grand Canyon. We were totally surprised to see so much snow. We had lots of fun together. 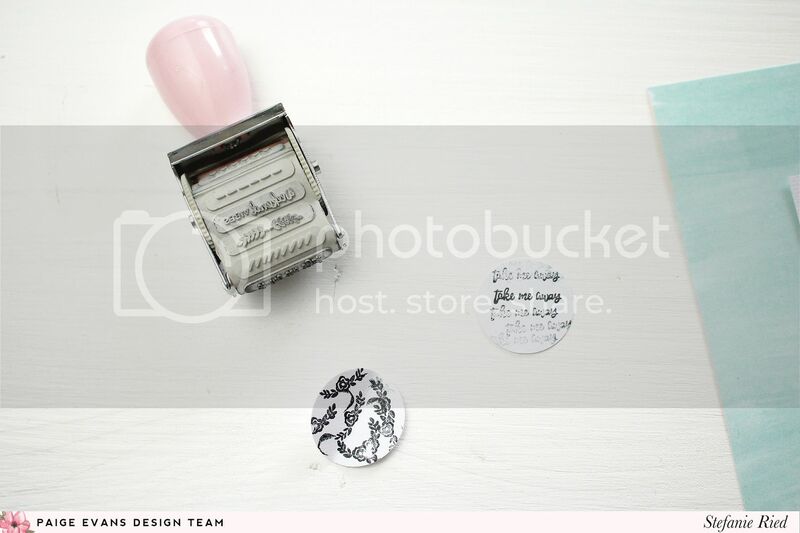 I selected a light background, Fancy Free Paper 10, and small colorful color dots as an eye-catcher. 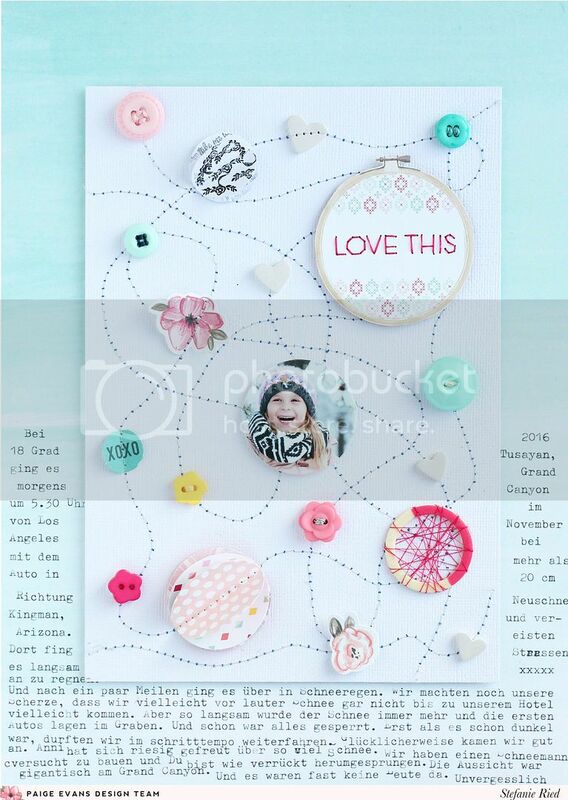 The great embellishments from Paige's collections fit perfectly into this winter fun layout. As a background I used a turquoise paper with white cardstock on top. First I chose the embellishments. These should be as small and round as possible. The buttons fit perfectly. 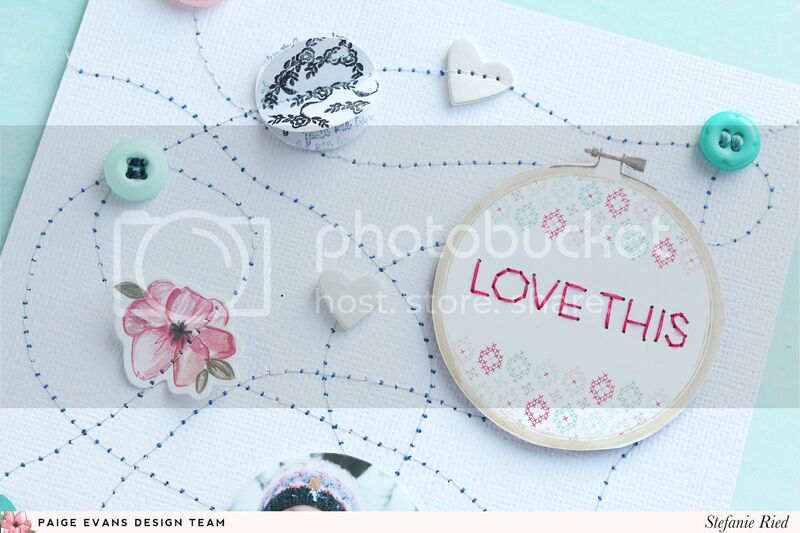 For the title, I have cut the "Love This" embroidery hoop out of a paper from Take Me Away. I embroidered this with sewing thread for the title. Also with sewing thread, I wrapped the small, round Wood Veneer. On the back I attached mini glue dots to keep the thread in place. 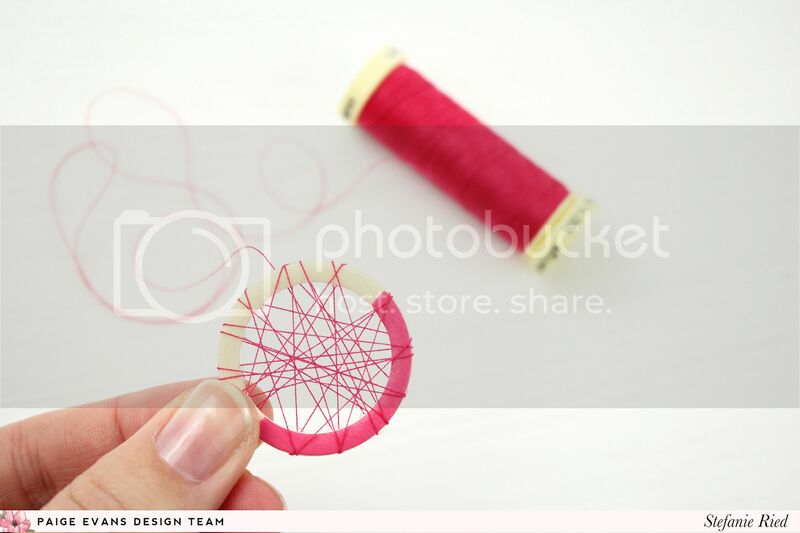 In order to achieve a 3D effect, I created a ball out of cut out paper circles. 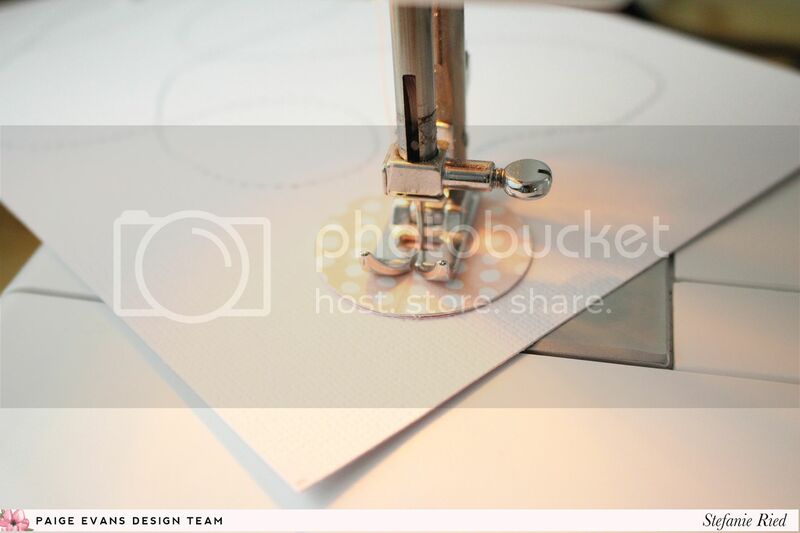 Three paper circles were folded in the middle and sewn with the sewing machine on the cardstock later. I created a smaller 3D ball with two stamped paper circles. For this I used the Roller Stamp from the Take Me Away Collection. I arranged the embellishments and the photo on the white cardstock. Just as I like it. Then I added machine stitching and the other embellishments and the photo glued to the lines. I wrote the journaling on the background with a typewriter. For that I had previously sketched on the paper the area. 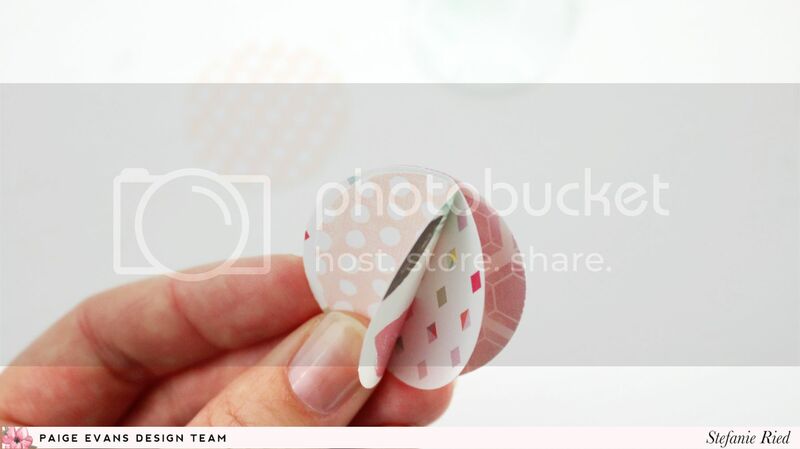 And lastly, I attached the sewn white cardstock with 3D glue dots. I hope you liked my first project and are inspired to create a winter layout with the great collections from Paige! With their bright colors they fit perfectly to any season and occasion! I love it, it's so wonderful. A very inspiring Layout. But now I have to do some homework on this holiday. Wow wow wow!! This is amazing! Can't wait to see what else she creates!!!!!!!!!!! !